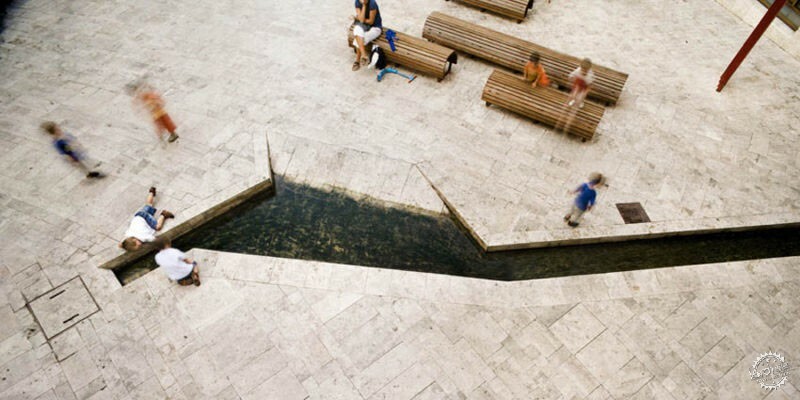 The design of open-air public spaces in cities with historical backgrounds usually borrows inspiration from the past. Periods such as the Αncient Τimes, the Renaissance, and the Μiddle Αges left strong footprints in major capitals of Europe, but these periods also left their marks in smaller towns. Banyoles is one such small town in Catalonia where visitors feel like they are traveling back in time. So, it comes as no surprise that Miàs Arquitectes decided to bring back the town’s medieval character to the newly renovated town center. Their decision was based on the center’s location, surrounded by old buildings and architectural features with a strong past. Miàs Arquitectes’ design references the medieval past of the city, while also striking a balance between the functional and aesthetic features. 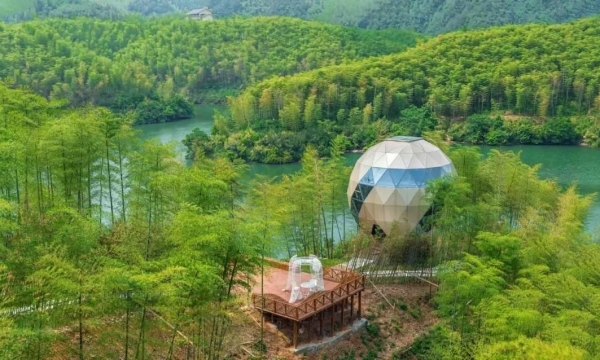 The Banyoles redesign project became one of the most successful projects the team has designed and it received several awards and recognition including the Catalonia Construction Award (2009) and Girona Area Architectural Awards (2007). In the 9th century, the monks of Sant Esteve Monastery excavated the land around Banyoles to create a drainage canal system, which also linked the city to Lake Banyoles. The purpose of the drainage channels was to supply the city with water from the lake and to offer flood protection for the city. The water was also used in agribusiness and pre-industrial craft works. The footprint of the canal was well maintained and can still be seen in the layout and architecture of the remaining buildings. Many of these buildings are made of travertine stone, found locally in the subsoil of the town. In modern years, the drainage channels were covered and eventually joined with the city’s sewer system. 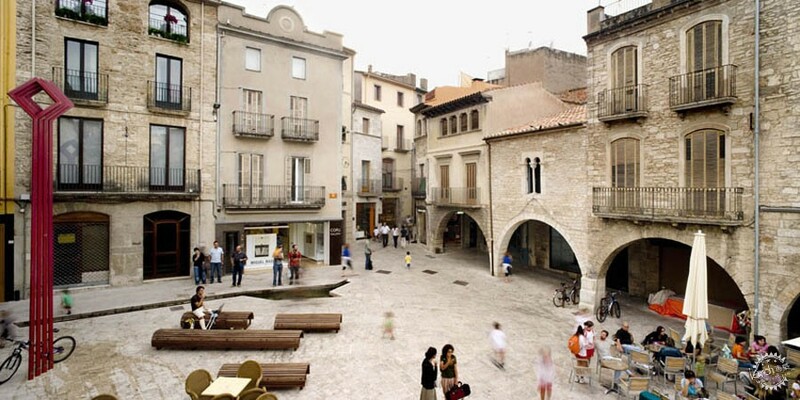 Losing its key feature, Banyoles became a deteriorated zone without charm. The urban framework of narrow sidewalks in the town center was essentially a point of cohabitation between pedestrians and vehicles with covered channels and pedestrian areas around the Central Square used as periodic parking spaces. This situation led the town authorities to search for an architectural solution that would bring the attraction back and form a significant center, combined with a more contemporary aspect. 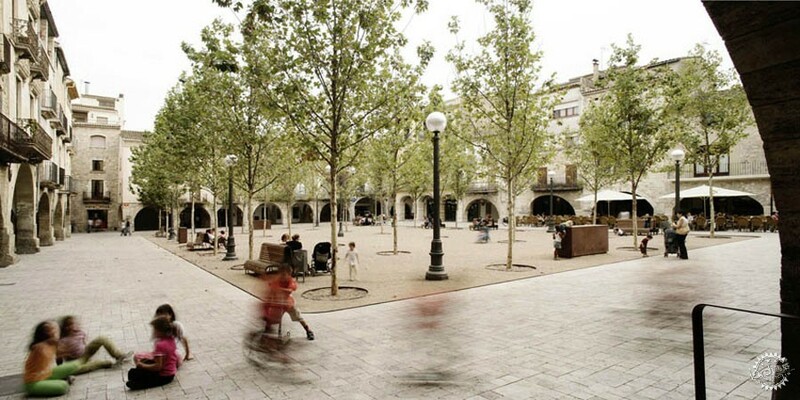 The Banyoles City Council commissioned Miàs Architects to redesign the center of Banyoles. As a city with a long past, the first decision was to choose which previous era should be brought back to the surface. 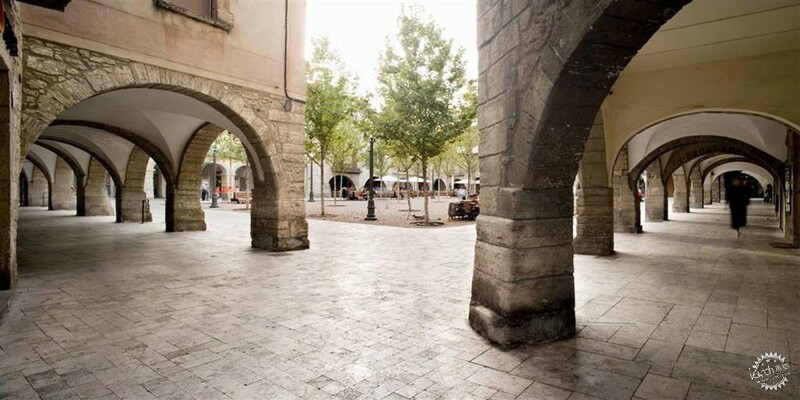 The medieval town of Banyoles provided the most architecture, so designers decided it would be the best time period to restore. The design stated that almost all of the accessible areas should be pedestrianized, removing the old sidewalks. The removal of the old sidewalks allowed the historical layers of the town to emerge, including the remains of buildings, old canals, and tombs. 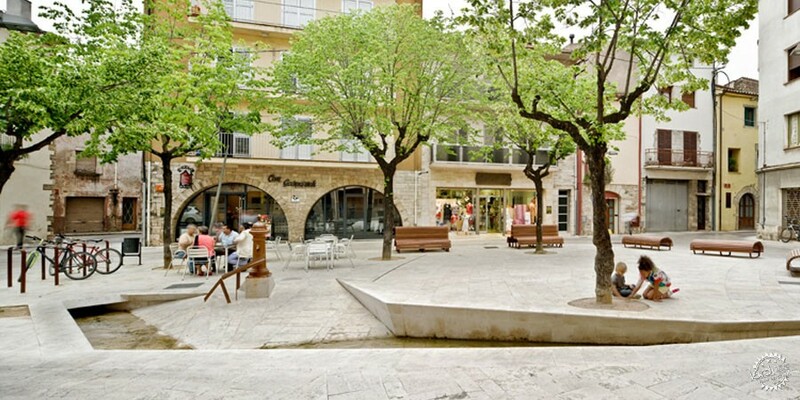 The calcareous stone, travertine, resides in the subsoil of Banyoles and was often used in the architecture of Banyoles. 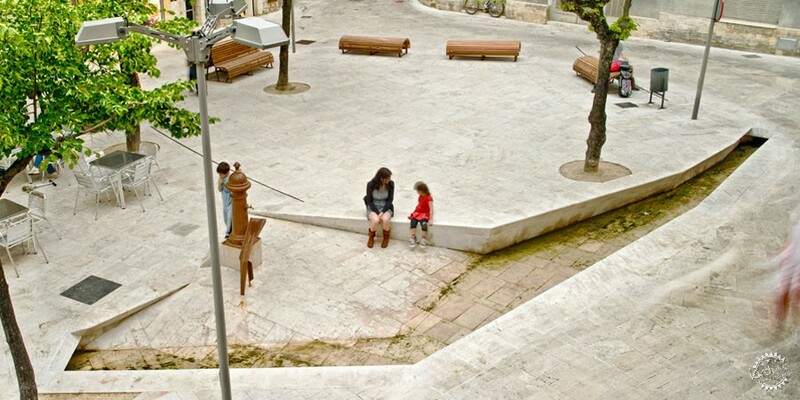 With this in mind, the architects designed a pedestrian network that unites the squares of the city. The plan was based on an arrangement of successive squares, among them the ‘Plaça dels Turers’, ‘Plaça Major’ (Central Square), ‘Plaça dels estudis’ (Studies Square), ‘Plaça de la Font’ (Water Source Square), ‘Plaça del teatre’ (Theater Square), ‘Plaça de l’església Santa Maria’ (Square of the Church of Santa Maria), and the ‘Plaça del monestir’ (Monastery Square). The squares were named for the important buildings located within them, mainly museums or churches. The architectural idea of Miàs Arquitectes ‘covers’ the city center in a travertine stone mosaic with the Central Square as its departing point and extending out to the open spaces of smaller squares. As a complete project, it looks like the ground has lifted to form the medieval houses, mysterious buildings, monuments, and churches, even though they have always been there. The flow of water was a key element of the city’s everyday life. The second strong movement of the project was to bring water back into the city through the irrigation canals. The existing canals that had been covered for years were exposed and new ones were created as sections to the stone ground. 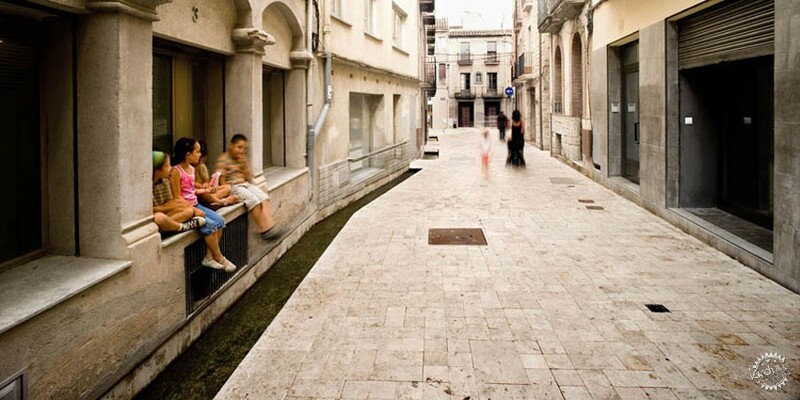 In some canals, the ground increases infinitely, attracting children to play, while other canals allow water to flow around the center, giving inhabitants the sense of serenity while wandering in the ‘new’ city. 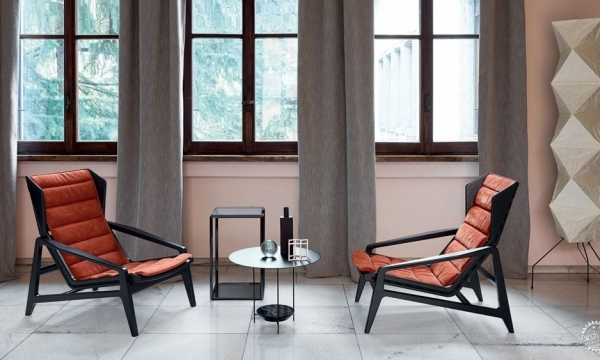 The urban furniture used in the design is quite minimal, highlighting the two main features, water and stone. Wooden seats have been placed in groups, in the open spaces, creating small ‘neighborhoods’ with deciduous trees placed around them in a linear fashion. The change in the foliage of the trees creates alternating scenery through the seasons. 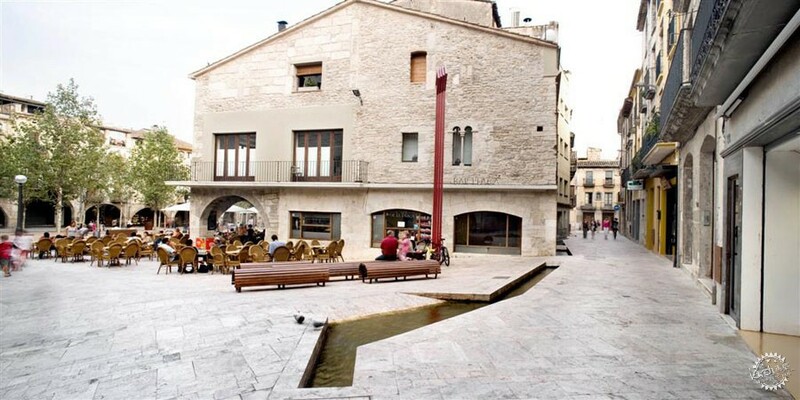 As the city is a fusion of historical layering, the Banyoles redesign project uses the past as a material for a contemporary public space. The logic of the architectural idea avoided the usual practice of adding one more layer to the city, and instead, turned to the daylighting of an older layer. All images courtesy of Adrià Goula.